Known for bringing classic Pulp characters back to life with a modern relevance and vibrance, Pro Se Productions announces the debut of the latest volume in its Charles Boeckman Presents imprint. 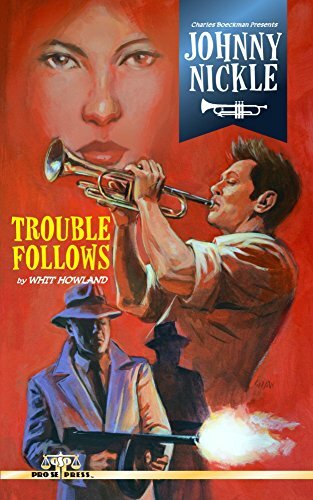 Charles Boeckman Presents Johnny Nickle in Trouble Follows by Whit Howland is also the first appearance of Mister Boeckman’s jazz musician with a knack for mystery in his very own digest novel from Pro Se Productions. Charles Boeckman, now 93 years old, was a writer of many stories back in the heyday of Pulp and beyond, mostly suspense/mystery and western tales. Due to his publishing of a collection of his mystery stories, Pro Se Productions became aware of his work and pursued the opportunity to bring many of his characters from what had been one shot stories back to life in new tales by today’s best Genre Fiction writers. This opportunity grew into Charles Boeckman Presents, with this latest digest novel featuring Johnny Nickle being the third printed volume in the imprint. In a return engagement, Charles Boeckman Presents Johnny Nickle! A classic Pulp character created by Boeckman in the golden age of Pulp Fiction, Nickle returns to the stage to perform his wild new single- Trouble Follows by Whit Howland! Boeckman's Johnny Nickle returns to a familiar groove in a new adventure involving maidens, mobsters, and music in a situation that could lead to a permanent premature curtain call for our hero with the horn! Because, if there's one thing you should know by now, wherever Johnny Nickle goes…Trouble Follows! Charles Boeckman Presents Johnny Nickle in Trouble Follows features stylish artwork by Adam Shaw and jazzy logo design by Sean Ali. The print version formatted by Ali is now available for $9.00 via Amazon at http://amzn.to/1BkVu2w and at Pro Se’s own store at http://bit.ly/1GloDKF. This jam session of action is also available as an eBook formatted by Russ Anderson for the Kindle at http://amzn.to/1F5dNua and for most formats at http://bit.ly/1MoxjUMfor only $2.99.